. "Canada at the Olympic Summer Games". The Canadian Encyclopedia, 22 June 2018, Historica Canada. https://www.thecanadianencyclopedia.ca/en/article/summer-olympic-games. Accessed 20 April 2019. Olympic Games are an international sports competition, held every four years. Until 1992 the Olympic Summer Games and the Olympic Winter Games were held in the same year, but beginning in 1994 they were rescheduled so that they are held in alternate even-numbered years. 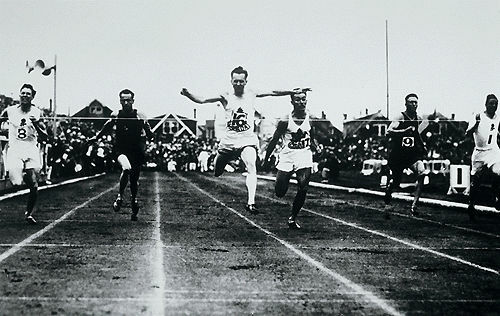 Percy Williams winning the gold medal in the 100 m at the 1930 British Empire Games, Hamilton, Ontario (courtesy Canada's Sports Hall of Fame). The original Olympic Games were held in ancient Greece between 776 BC and 393 AD, as a celebration of the god Zeus. The Games exemplified the ancient Greek pursuit of excellence and reverence for physical beauty. The festival was held every four years at Olympia, in the eastern Peloponnese, and included chariot and horse races, foot races, boxing, wrestling, and pentathlon. Tales of the glory of the Games persisted and were revived when 19th century archaeologists proved that they existed as an actual event rather than just in mythology. The revival of the Olympian Games in modern times was the obsession of French educator and thinker Pierre de Coubertin, who saw them as a means to promote peace. The first modern Games were held in Athens in 1896. They were on a modest scale, with about 250 athletes from 14 countries. There were 43 events in 9 different sports. In contrast, the 1996 Summer Olympics in Atlanta, Georgia, included more than 10,000 athletes from more than 190 countries competing in 271 events in 29 different sports. In many countries, athletes qualify for the Olympics by winning or finishing well in selection trials. An athlete must be a citizen of a country in order to represent that country. For many years, only amateur athletes competed in the Games, but professional athletes are now eligible to compete in most Olympic sports. In most Olympic sports, a nation may enter as many as three competitors in each event as long as the athletes meet a minimum standard set by the international governing body of that sport. National teams must win or place high in qualifying tournaments to make the final competition. The host country is allowed to enter a team in every team event. Each first-place winner receives a gold medal, which is actually made of silver and coated with gold. The second-place medal is silver, and the third-place medal is bronze. The design for the medal changes for each Olympics. All members of a winning relay team get a medal, including those who participated only in qualifying rounds. In team sports, all the members of a winning team who have played in at least one of the games during the competition receive a medal. The 1896 games included events in cycling, fencing, gymnastics, target shooting, swimming, tennis, track and field, weightlifting and wrestling. James B. Connolly of the United States became the first modern Olympic champion, winning the triple jump (then known as the hop, step, and jump). Appropriately, a Greek athlete, Spyridon Louis, won the first marathon race. Canadians did not compete. The games of 1900 and 1904 attracted little attention. The 1900 Olympics were held as a sideshow to a world's fair in Paris. They included the first competitions involving women — in lawn tennis and golf. The first women gold medalists were British tennis player Charlotte Cooper and American golfer Margaret Abbott. Canada did not send an official team to the Olympic Games, but George Orton, a Canadian studying in the United States, travelled to Paris with the American team and won a gold medal in the 3000 m steeplechase, a bronze in the 400 m hurdles and finished fifth in the 4000 m steeplechase. Poor attendance also plagued the 1904 Olympics, which were held as part of the Louisiana Purchase Exposition in St. Louis, Missouri. Canada sent its first official team, which won four gold medals (in weight toss, golf, lacrosse and soccer) as well as a silver medal in rowing. One of Canada's gold medallists that year was Étienne Desmarteau, a police officer from Montréal, who was fired from the force for taking a leave of absence to go to the Games. He won gold for the 56-pound weight throw. He died the following year at the age of 28 from typhoid. The Winnipeg Shamrocks captured the gold in lacrosse. George Lyon won the gold medal in golf, and a team from Galt, Ontario, won the gold in soccer. Two years after the 1904 Games, Intermediary Games were held in Athens to try to preserve the historic ties between Greece and the Games. William Sherring, one of only three Canadian athletes at the Games, won the gold medal in the marathon. No further Intermediary Games were held and the results of 1904 are not officially recognized. Canadians returned from the 1908 Games with three gold, three silver and nine bronze medals. Robert Kerr won gold in the 200-m race, Walter Ewing won gold in shooting and the national team won gold in lacrosse. The 1908 Games were the first to include a winter sport, figure skating. 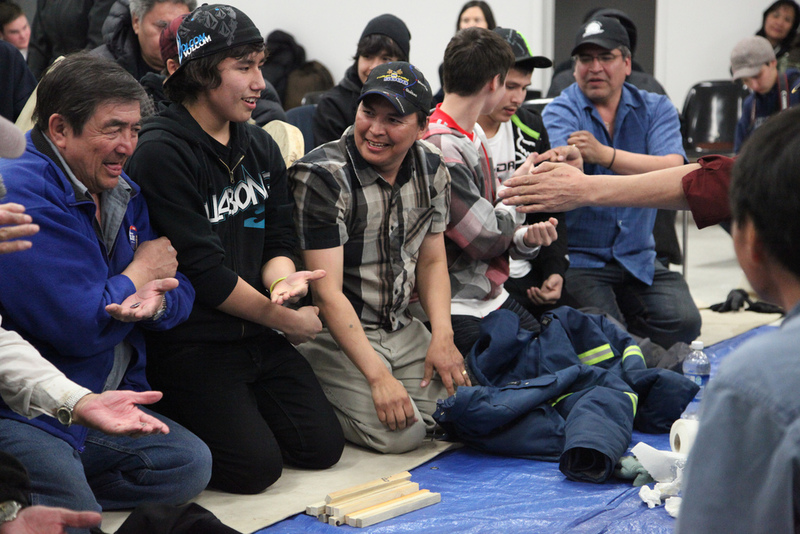 Canada was expected to win gold in the marathon, with Tom Longboat from the Six Nations Reserve the heavy favourite. Instead, the event turned into one of the most dramatic moments in Olympic history. The marathon began on the lawns of Windsor Castle, meaning the runners would cover a distance of 26 miles, 385 yards. Longboat, who had won the 1906 Toronto marathon and the 1907 Boston marathon in record time, grabbed the lead at the start. After a slow start Longboat moved into second place at the 14-mile mark. But only five miles later, he suddenly pulled up lame and was put into a car. Rumours quickly spread that Longboat had been drugged by his handlers so that they could collect on huge gambling sums. Back at the stadium, Italian Dorando Pietri stumbled to the finish line. But the heat got to him as well, as he fell five times while trying to finish the race. When American John Hayes appeared in the stadium, it appeared that he would take the gold over the disoriented Pietri. Chief marathon official Jack Andrew, who did not want to see an American cross the line first, bolted from the stands and dragged the Italian runner across the line. The illegal victory was short lived as the Americans protested and Hayes was awarded the gold medal. Canada sent a small team of 36 athletes to Stockholm. George Goulding won gold in the 10,000 m walk while George Hodgson was a double gold medalist in swimming (400 m and 1500 m) — Canada's first double gold medalist at the Olympics. Hodgson would go on to break three world records in the pool. Calvin Bricker and Duncan Gillis won silver in athletics while William Happeny, Frank Lukeman and Everard Butler brought home bronze medals in athletics and rowing, respectively. The Stockholm games are best remembered for the feats of the young Native American Jim Thorpe. He won the pentathlon and the very next day, while most of his competitors were recovering, Thorpe went out and competed in the decathlon, easily winning the gold medal. A year after his accomplishments, it was revealed that Thorpe had received $60 a month playing baseball. This went against the Olympic amateur code and Thorpe was asked to return his gold medals. The IOC belatedly returned the medals 30 years after his death. The First World War forced the cancellation of the 1916 Games, planned for Berlin, Germany. Four years later, sympathy for Belgium, which had been devastated by the German invasion during the war, persuaded the IOC to award the 1920 Games to Antwerp. Since many of the Olympic participants were Allied soldiers, Germany, Austria, Bulgaria, Hungary and Turkey were not invited to participate in order to prevent conflict. At the 1920 Games, Finnish runner Paavo Nurmi, nicknamed the Flying Finn, won three of his nine career Olympic gold medals, with victories in the 10,000 m race, the individual cross-country race, and the team cross-country race. Saskatchewan's Earl Thompson won the gold medal for Canada in the 110 m hurdles in world-record time. Canada's other gold medal was collected by boxer Albert Schneider. Ice hockey made its debut at the 1920 Games. The Winnipeg Falcons represented Canada and defeated Sweden 12–1 to win the title. The Games also featured figure skating. In 1924, two separate competitions were held: the Olympic Summer Games and the Olympic Winter Games. At the 1924 Summer Games in Paris, Finnish runner Nurmi and American swimmer Johnny Weissmuller were the outstanding athletes. Nurmi's major victories included wins in the 1500 m and 5000 m races. Weissmuller won the 100 m and 400 m freestyle races and was a member of the winning 4 × 200 m freestyle relay team. The 1924 Olympics provided the story behind the movie Chariots of Fire, based on the feats of British sprint champions Harold Abrahams and Eric Liddell. Canadian rowers won two silver medals at the 1924 Games (men’s coxless four and men’s eight). Another Canadian team earned silver in shooting, in the men’s team clay pigeons. Canadian boxer Daniel Lewis won the bronze medal in boxing (welterweight division). Canada did not win a gold medal at these games. However, the Edmonton Grads won an "unofficial" championship in women's basketball, which was an auxiliary event at the Games (they repeated this feat in 1928, 1932 and 1936). The 1928 Games in Amsterdam, Netherlands, were notable for the debut of women's track-and-field events. Seven Canadian women (six sprinters and one swimmer) medalled at the competition, winning two gold medals, a silver and a bronze. Ethel Catherwood, Fanny Rosenfeld, Ethel Smith, Florence Bell and Myrtle Cook became the first Canadian women to win Olympic gold, in the relay. Catherwood also won gold in the high jump. Phil Edwards captured bronze in the 4 × 400 m relay. It would be the first of five Olympic medals won by Edwards throughout his Olympic career, a record for Canadian athletes that was not met until 2002 (Marc Gagnon) and not exceeded until 2006 (Cindy Klassen). The men's relay team also broke a previous record with their third place finish, behind the victorious American squad and the Germans. Vancouver's Percy Williams stunned everyone by becoming the first non-American to sweep the 100 m and 200 m sprints. The IOC decided in 1930 to continue its experiment with women's sports in the Olympics. Because of this decision, Babe Didrikson of the United States became the most celebrated athlete of the 1932 games in Los Angeles. She won the 80-meter hurdles race and the javelin event, establishing new world records in both events, and finished second in the high jump event. Despite the problems Canadian athletes had getting to the games, owing to a lack of funds, Canada won 15 medals. Phil Edwards won three bronze medals in track. Alex Wilson won a silver and two bronze in track. Duncan McNaughton won gold in the high-jump competition and Horace Gwynne a gold in boxing. These games were supposed to be a showcase for Hitler's Third Reich but the most dramatic story of the Berlin games was Black American athlete Jesse Owens, who won four gold medals. Canadian Philip Edwards captured a bronze medal in the 800-m race — his fifth medal in Olympic competition for Canada. Canada's lone gold came from canoeist Frank Amyot, who had to pay his own way to Berlin in order to compete after Canadian Olympic officials refused to support him. With Canadian James Naismith, the inventor of basketball, in attendance, Canada lost only one basketball game on their way to a silver medal. The 1940 and 1944 Olympics, scheduled for Tokyo and London, respectively, were cancelled because of the Second World War (1939–45). The 1948 games were supposed to have been held in Helsinki but Finland had not yet recovered from the war and the Games were moved to London. Germany and Japan were not invited to take part in the games and Russia declined. Canadian athletes won three medals, led by Douglas Bennett, who won silver in canoeing while the women's 4 × 100 m relay won bronze and Norman Lane took bronze in canoeing. The 1948 games are remembered worldwide for Fanny Blankers-Koen of the Netherlands, the only woman to win four track-and-field gold medals in one Olympics. The Finnish capital finally played host to the Games in 1952 after having to decline them in 1948. The most significant addition to the competing nations was the Soviet Union, which in previous years had disdained the Games as a capitalist showcase. The Soviet team achieved great success, and Americans were shocked that until the last day of competition, Soviet athletes had won more medals than American athletes. Despite sending its largest delegation to date to the Olympics, Canadian athletes only won three medals. George Genereux, a 17-year-old high school student, captured gold in shooting. Gérald Gratton won silver in weightlifting while Don Hawgood and Ken Lane won silvers in canoeing. Canada's rowing shells were severely damaged in a ship's storeroom on the way over to Finland. Rowers eventually had to borrow boats from Sweden, but failed to win medals. Soviet and American teams continued their success at the 1956 Games, finishing first and second in the unofficial tally of national medals. The Australian team, led by swimmers Murray Rose and Dawn Fraser, and runners Betty Cuthbert and Shirley Strickland, won a total of 13 gold medals to finish third in the national medal standings. The Melbourne Games were also responsible for setting another precedent, when all athletes marched freely in the closing ceremonies. The suggestion had been made by a young Australian schoolboy of Chinese descent and was adopted by the International Olympic Committee in 1956. Frank Reid's University of British Columbia rowers highlighted the games for Canada. The men's fours swept through their preliminary heats. They found themselves in last place to start the Olympic final but at the halfway mark, pulled even with their competitors, eventually winning by five lengths. The Canadian eights crew finished second to the Americans. Canadian Gerald Ouellett, who won gold in sharp-shooting, appeared at first to have set a world record with a perfect score of 600 in the final. But it was later discovered that the distance at which he shot was set at imperial, not metric, distance. In the 1960s African runners, such as Wilson Kiprigut of Kenya and Abebe Bikila of Ethiopia, achieved Olympic prominence, while athletes from Eastern Europe dominated gymnastics and weightlifting events. For the first time ever, television rights were granted and millions of people were able to watch the Olympic Games on 100 television networks around the world. Unfortunately, Canada suffered its poorest medal performance at the Olympics, winning only a silver medal in rowing courtesy of the men's eight with cox. The closest Canada came to winning a second medal was in the men's 4 × 100 medley swim relay, in which the Canadians finished fourth. Following an aborted attempt to stage the Olympics in 1940, Tokyo became the first Asian city to stage the Games in 1964. The Japanese used the occasion to display their latest technology, using computers for the first time. Records were set in all 18 swimming events with the Americans collecting 16 of 22 gold medals awarded in swimming and diving. The Canadian team came away with four medals, including an 800 m silver medal by Bill Crothers and Harry Jerome's bronze medal performance in the 100 m sprint event. Rowers Roger Jackson and George Hungerford emerged with Canada's only gold of the 1964 games. The medal ceremonies for Jackson and Hungerford were accompanied by "O Canada" for the first time, though the flag raised was still the Red Ensign. The 1968 Summer Games were held in Mexico City during a period of political turmoil throughout the world. The most controversial episode took place during the medal ceremony for the men's 200-m dash. The gold and bronze medals were won by African American sprinters Tommie Smith and John Carlos. To protest racism in the United States, both athletes raised clenched fists in a "black power" salute during the playing of the US national anthem. Mexico City's high altitude was disastrous for athletes in long-distance races and other endurance events, but it contributed to world records in many other contests. The most famous record was 29 feet 21/2 inches (8.90 meters) in the long jump, set by Bob Beamon of the United States. That world record lasted a remarkable 23 years. Swimmer Elaine Tanner captured three medals for Canada — two silver in the 100 m and 200 m backstroke and a bronze as part of the 4 × 100 m freestyle relay. Canada's sole gold medal came from Jim Elder, Jim Day and Tom Gayford in the equestrian event. Tragedy struck the Munich Olympics when Palestinian terrorists murdered nine Israeli athletes. Five terrorists and one policeman also died. The athletic stars were Soviet gymnast Olga Korbut with three gold medals and American swimmer Mark Spitz with seven. Canadian athletes won two silver and five bronze medals in swimming and yachting. The 1976 Summer Games, held in Montréal, were hit by a boycott led by Tanzania. More than 20 African nations and two other countries refused to compete. The boycotting nations demanded that New Zealand be banned from competition because a New Zealand rugby team had toured South Africa. 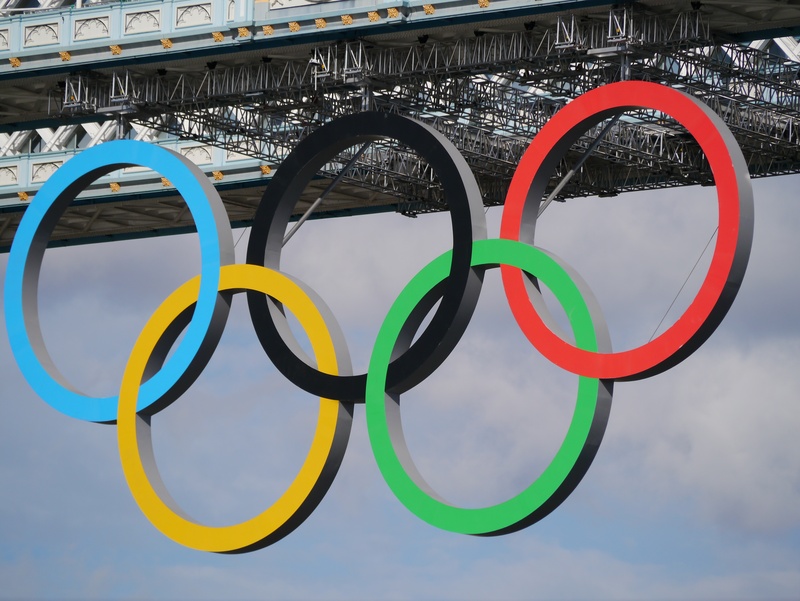 The IOC refused, saying that it had no control over rugby, which was not an Olympic sport. Nadia Comaneci of Romania won the women's all-around gymnastics title, and in the uneven-bars event she earned the first perfect score of 10.00 in Olympic gymnastics competition. The most outstanding performance at the 1976 games came from the East German women's swimming team, now known to have taken performance drugs, which won 11 of 13 races. Though Canada failed to win gold on its home ground, the 11 medals, including five silvers, won by Canadian athletes more than doubled the total of the previous two Olympic Games. Swimmer Nancy Garapick became the only double medallist for Canada, winning bronze in the 100-m and 200-m backstroke. The United States government boycotted the 1980 Games to protest the Soviet Union's invasion of Afghanistan. Canada joined the boycott to the disappointment of 211 Canadian athletes. With 62 nations boycotting, the Soviet team collected 80 gold medals, 69 silver medals, and 46 bronze medals. The great Cuban boxer Teófilo Stevenson won his third consecutive Olympic gold medal in the heavyweight class. The Soviet Union, in retaliation for the American boycott four years before, elected not to send a team to the United States. Thirteen Soviet bloc nations also joined in the boycott. The American team claimed 83 gold medals, 61 silver medals, and 30 bronze medals. American Carl Lewis, who won four events (100-m, 200-m, 4 × 100-m relay, and long jump), emerged as the greatest track-and-field athlete of his time. Canada was also a beneficiary of the boycott, winning an unprecedented 44 medals, including a record 10 gold. The water produced six medals in canoeing, six in rowing, three in yachting, a gold in diving and ten in swimming, including four gold. Alex Baumann set two world records on his way to winning gold medals in the 200-m individual medley and the 400-m individual medley. 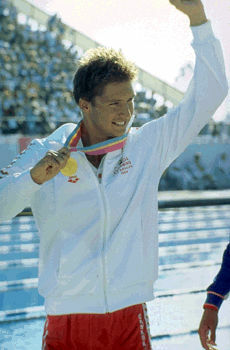 Victor Davis also set a world record in winning gold in the 200-m breaststroke. Anne Ottenbrite took gold in the women's 200-m breaststroke while Sylvie Bernier won gold in the springboard diving event. Lori Fung won the first gold medal in rhythmic gymnastics while Larry Cain and the team of Alwyn Morris and Hugh Fisher won gold medals in canoeing. The men's rowing eights took gold and Linda Thom won gold for match pistols. The 1988 games in Seoul, South Korea, were dominated by the scandal of Ben Johnson, who tested positive for steroids after winning the 100-m sprint in record time. The issue of drugs hung over the Games as East German swimmers, led by Kristin Otto, won 10 of the 15 events for women and American track-and-field athlete Florence Griffith Joyner dramatically improved her performance to win the 100-m and 200-m races. Synchronized swimmer Carolyn Waldo won two gold medals in the solo and duet (with Michelle Cameron) events. Lennox Lewis won a gold medal in boxing. Egerton Marcus took home silver and Ray Downey bronze, also in boxing. The men's relay swimming team led by Victor Davis won silver while the women's team took bronze. Decathlete Dave Steen earned a bronze medal with a brave performance in the final event. At the 1992 games in Barcelona, no single nation dominated competition, with athletes from many countries winning events. The publicity around the Games focussed on the United States national basketball team, the so-called "Dream Team" which completely dominated its competition. Canada tallied 18 medals, of which six were gold. Four of the gold medals came in rowing: women's pairs, women's fours, women's eights and men's eights. Silken Laumann won a bronze in the single sculls only 10 weeks after suffering a terrible accident during training. Synchronized swimmer Sylvie Frechette lost a gold medal on a scoring error but was awarded one after an inquiry was held. Mark Tewksbury set an Olympic record in the 100-m backstroke and Mark McKoy won gold in the 110-m hurdles — his last for Canada before taking up Austrian citizenship. In 1996 the centennial anniversary of the modern Olympic Games was celebrated in Atlanta, Georgia. The games were marred by a bombing in Atlanta's Centennial Olympic Park which left one person dead and more than 100 wounded. In track and field, American Michael Johnson won gold medals in the 200-m and 400-m dashes. However, it was Canadian Donovan Bailey who triumphed in the 100-m dash, the glory event of track and field. He and teammates Robert Esmie, Glenroy Gilbert and Bruny Surin won gold in the 4 × 100-m relay, beating a favoured American team. Marnie McBean and Kathleen Heddle won gold in the women's double sculls. Doping scandals resurfaced at the 2000 Olympic Games in Sydney, Australia. Seven athletes tested positive during competition and dozens were disqualified prior to competing. There was little else that disrupted the games, and with unprecedented ticket sales and television coverage, the XXVIIth Olympics were hailed as the greatest Olympic Games ever held. Canadian athletes returned home with 14 medals, eight less than Atlanta in 1996. Still, it was the fourth-best Canadian Olympic performance ever. Canada did remarkably well in inaugural events: Simon Whitfield won the first-ever Olympic gold medal for triathlon; Karen Cockburn and Mathieu Turgeon won bronze medals in the first Olympic trampoline competition; Dominique Bosshart won a bronze in tae kwon do. Canada's only double medal winner was three-time Olympian Anne Montminy, who won silver in the 10m synchro diving (another first-time event) and bronze in the women's 10m platform. Nigerian-born freestyle wrestler Daniel Igali won Canada's first-ever gold medal in wrestling. Men's tennis doubles Daniel Nestor and Sebastien Lareau upset the number one seed Australians Mark Woodforde and Todd Woodbridge to claim Canada's third gold medal of the games. Canada's performance at Athens was consistent with previous years, and concerns were voiced again by athletes, coaches and some of the Canadian public that public and private funding sources for athletes was dismal in comparison to other countries, particularly those in the Commonwealth such as Australia. Poor medal performances in 2000 prompted controversial changes in Canadian Olympic Committee policy prior to 2004, whereby Canada would send fewer athletes to future Games and focus financial resources on those athletes who have the best chance at a medal. As a result, only 200 athletes from Canada competed in Athens, the lowest since the 1980 boycott. Still, as in other years, Canadian athletes achieved many significant "firsts." Canada won a total of 12 medals: three gold, six silver, and three bronze. Kyle Shewfelt won Canada's men's floor exercises in gymnastics; Lori-Ann Muenzer won the women's track cycling sprint, the first gold medal in cycling for Canada; and Adam van Koeverden won Canada's first gold in kayaking in the men's K1 500 m kayak. The silver medallists were: Karen Cockburn in women's trampoline gymnastics; men's four rowing team Cameron Baerg, Jake Wetzel, Thomas Herschmiller and Barney Williams; Tonya Verbeek in women's 55 kg freestyle wrestling; Alexandre Despatie in the men's 3 m springboard diving; Marie-Hélène Prémont in the women's cross country mountain bike; and Ross MacDonald and Mike Wolfs in men's Star sailing. Bronze medal winners include: Blythe Hartley and Emilie Heymans in women's synchronized 10 m platform diving; Koeverden in men's K1 1000 m kayak; and Caroline Brunet in the women's K1 500 m. Wheelchair racer Chantal Petitclerc won gold in the women's 800 m wheelchair, a demonstration event that year. The 2008 Summer Olympic Games were marked as much by politics as by sports. The IOC came under fire by the media immediately upon announcing its decision to allow China to host the Games, due to the country’s highly criticized lack of human rights policies and poor environmental record. In all, 205 countries were represented in 28 sports. There were some stunning moments; American swimmer Michael Phelps set a record for the most gold medals (8) won in any Olympics and the Jamaican track team, led by sprinter Usain Bolt, won six gold medals in the sprint and hurdles events. Canadians enjoyed considerable success at Beijing, garnering 20 medals (three gold, nine silver, eight bronze). Canada’s first medals came relatively late in the Games, on day eight, when David Calder and Scott Frandsen won silver in men’s pairs rowing and wrestler Carol Huynh won gold. They were followed by another eight silver medals (Simon Whitfield in triathlon; Adam van Koeverden in kayaking; Emilie Heymans and Alexandre Despatie in diving; the equestrian team in show jumping; Karen Cockburn and Jason Burnett in trampoline; Karine Sergerie in taekwondo), and eight bronze medals (Priscilla Lopes-Schliep in hurdles; Thomas Hall in canoeing; the men’s fours rowing team; Tonya Verbeek in wrestling; Ryan Cochrane in swimming; Dylan Armstrong in shotput, who was awarded the bronze in August 2014 after third-place Andrei Mikhnevich’s results were annulled because of doping; and Christine Girard in weightlifting, who was awarded the bronze in 2018 after second-place Irina Nekrassova failed a re-test and was disqualified). The surprise winners in 2008 were from the equestrian team; longtime Olympian Ian Millar and his team of Eric Lamaze, Mac Cone and Jill Henselwood won silver, Canada’s first medal in the sport since 1976. Later, Lamaze won gold in individual jumping, the country’s first individual gold medal in equestrian and the second individual show jumping medal in Olympic history. The London games offered its share of history-making moments, as well as a few controversies. With approximately 10,500 athletes from 204 countries vying for medals, the biggest newsmaker was again Michael Phelps, who won four golds and two silvers, bringing his career total to 22 medals, 18 of them gold. Runner Usain Bolt from Jamaica also wowed Olympic spectators, finishing with a record-breaking performance in the 4x100-metre relay and becoming the first man to win gold in the 100 and 200 metres at two Olympic competitions. In addition to impressive athletic performances, London also will be remembered for the growing involvement of female athletes with — for the first time — women’s athletic representation from every participating country, including Saudi Arabia, which boasted a 16-year-old judo competitor who became the first female from that country to compete in the Olympics. Canada took home 18 medals from London (two gold, five silver, 11 bronze). Rosie MacLennan won gold in women’s gymnastics (trampoline) and Christine Girard won the 63 kg weight class in women’s weightlifting. (Although Girard originally placed third in the competition, she was upgraded to gold in 2018 after the IOC disqualified the first and second-place finishers for doping.) Canada’s athletes also took home five silver medals (rowing, men’s eight; rowing, women’s eight; Ryan Cochrane, swimming, 1500 m men’s freestyle; Adam van Koeverden, canoeing, K-1 1000 m; Tonya Verbeek, wrestling, women’s freestyle 55 kg) and 11 bronze medals (women’s team in synchronized 3 m springboard diving; women’s team in synchronized 10 m platform diving; Antoine Valois-Fortier in judo, men’s 81 kg; Brent Hayden in swimming, men’s 100 m freestyle; cycling, women’s team pursuit; Derek Drouin in high jump; Mark Oldershaw in canoeing, C-1 1000 m; Carol Huynh in wrestling, women’s freestyle 48 kg; women’s tournament soccer; Richard Weinberger in swimming, 10 km open water; Mark de Jonge in canoeing, K-1 200 m). Buried in these bare statistics were several stories that made headlines and inspired pride in Canadians. Perhaps the most noteworthy of these stories involved Canada’s women’s soccer team and its quest for victory over the top-rated American team. 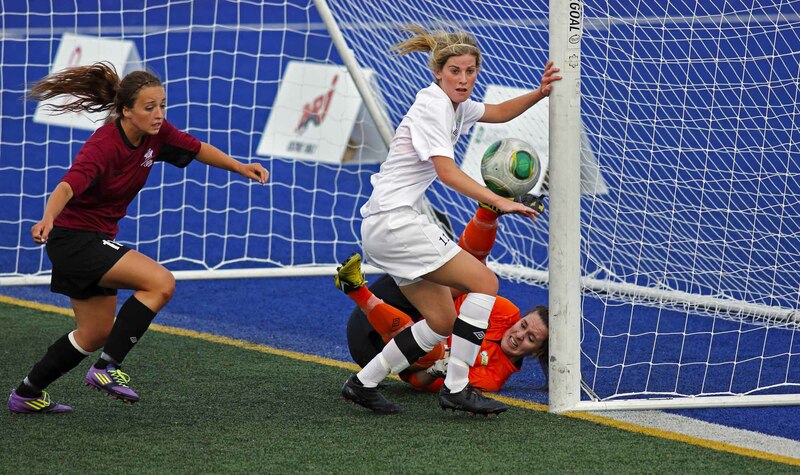 In their semi-final match, Canada dominated the field, with team captain Christine Sinclair scoring three goals before a sequence of controversial penalties against Canada allowed the American team to tie up the match in the final minutes of play. The United States went on to win the game in overtime and Canada had to be satisfied with a bronze medal, beating the French team in a 1–0 win three days later. The drama captured the imagination of Canadians and soccer followers worldwide, drawing attention to Canada’s excellent women’s team and their talented captain, Sinclair, who was recognized for her contribution by being chosen Canada’s flag bearer for the closing ceremonies. The 2016 Games in Rio, Brazil (5–21 August), were the first to be hosted by a South American country. In total, 11,303 athletes competed at the Games, representing 205 countries as well as a Refugee Olympic Team. Golf returned to the Games after an absence of 112 years, while rugby sevens made its debut. As in 2012, American swimmer Michael Phelps and Jamaican sprinter Usain Bolt dominated the news. Phelps won six medals (five gold), bringing his career total to 28 (23 golds) and making him the most decorated Olympic athlete ever. Bolt again won the 100m, 200m and 4X100m relay — for the third consecutive Games. It was a particularly successful Games for Canadian women athletes. The first Canadian gold medal of the 2016 Games was won by swimmer Penny Oleksiak. The 16-year-old became Canada’s youngest Olympic champion ever when she won the 100m freestyle event. By the end of the Games, she had won another three medals: a silver medal in the 100m butterfly, and two bronze medals in the 4X100m and 4X200m freestyle relays. With four medals in total, Oleksiak became the most successful Canadian athlete at a single Olympic Summer Games and tied Victor Davis as Canada’s most successful Olympic swimmer. Overall, Canadian swimmers took home six medals, with Kylie Masse winning bronze in the 100m backstroke and Hilary Caldwell winning bronze in the 200m backstroke. Canadian women also medalled in diving: Meaghan Benfeito took bronze in the 10m individual event and in the 10m synchronized event, with teammate Roseline Filion. On the water, Lindsay Jennerich and Patricia Obee won silver in the lightweight double sculls (rowing). Trampolinist Rosie MacLennan defended her Olympic title, winning her second gold medal in the sport. Wrestler Erica Wiebe took gold in the 75kg event, making her Canada’s third Olympic wrestling champion after Daniel Igali and Carol Huynh. In cycling, Canada again won bronze in the women’s team pursuit, while mountain biker Catharine Pendrel took bronze in the cross-country event. In team sports, Canada won its second consecutive bronze in women’s soccer, and its first bronze in women’s rugby sevens (which was making its Olympic debut). In track and field (athletics), Brianne Theisen-Eaton won bronze in the heptathlon, while teammate Damian Warner took bronze in the decathlon (the decathlon was won by American athlete Ashton Eaton, Brianne Theisen-Eaton’s husband). Derek Drouin won gold in high jump, the first Canadian champion in a field event since Duncan McNaughton won the high jump title at the 1932 Olympic Games in Los Angeles. Sprinter Andre De Grasse lived up to his promise at the Games, taking silver in the 200m and bronze in the 100m and 4X100m relay. Finally, Eric Lamaze won bronze in individual jumping, becoming Canada’s most decorated Olympian equestrian. In total, Canada came home with 22 medals (four gold, three silver and 15 bronze) and finished in 10th place overall. International Olympic CommitteeA great resource for information about all Olympic sports, events, competitors, and programs. Click on the "Olympic Games" tab at the top of the home page for news about furture games and data from previous events.